Those of you who follow me on Twitter may already know that I was forced, kicking and screaming, into going to the local County Fair last week. Honestly, for me to be away from a computer for more than a couple of hours fills me with such horror that, if it hadn't been for the promise of gyros (doner kebabs), I probably wouldn't have gone at all. I have no interest in looking at cows, rabbits, or chicken in cages, and the rusty bolts on the rides have always put me off getting on one. I've seen "Final Destination 3" (it wasn't good) and "Rollercoaster" so I have no intention of getting my head squished like a watermelon when one of the cars jumps its tracks. As I wandered around looking for apparently non-existent gyros, I happened across two pawn shop sellers who had set themselves up in tents to unload some of their stock. I didn't ever find gyros (I ended up with an overpriced $4 burger), so I decided to buy some $2 DVDs instead. 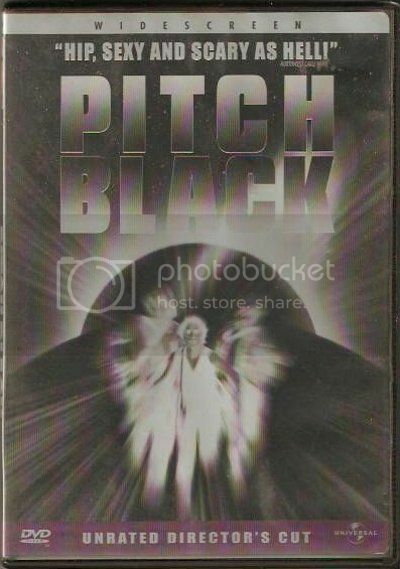 The first DVD I just had to have was "Pitch Black" (2000). I remember this as being very good indeed although I haven't rewatched it yet. Vin Diesel could do no wrong back then, and, of course, Claudia Black from "Farscape" was my main reason for buying it. I vaguely remember liking Radha Mitchell once too, but I'm not sure why. I kept seeing the fullscreen edition of "Pitch Black" every time I went to my local pawn shop, but I was holding out for this widescreen "Unrated Director's Cut". I have absolutely no interest in the other Riddick Chronicles though since I'm not into childish cartoons or video games. I bought "Frailty" (2001) just because it was there. I remember how a lot of horror fans seemed to go crazy and overrate it even though it isn't really a horror movie at all. I thought I'd give it another watch to see if was any better than the below average score which I gave it when it came out. I'm still not sure if I ever really liked Bill Paxton as an actor apart from his role in "Near Dark" (1987), but I'll find out. 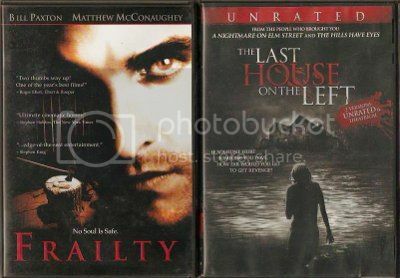 As for "The Last House on the Left" (2009), it wasn't a bad remake plus, because we've already established in my previous post that I'm becoming some kind of pervert, I wanted to look at Sara Paxton again. Isn't it weird that these last two films had Paxtons in them? So that was what I did last weekend. I have no idea why I didn't actually post this last week apart from the heat really getting to me and feeling pretty miserable all the time. Sometimes the internet is just too full of too many other distractions as well so, occasionally, I neglect my blogging in favour of more interesting online activities. I'll tell you about those another time, but I have now discovered the 60 year old American version of me. Yes, I've been listening to a lot of his podcasts and I agree almost 100% with the things he said in his recent Saturday show. There's a high probability that I will also make another "Bloody Podcast" later since I've been challenged to do something on the [REC] trilogy. I still haven't watched the third one so that's what I intend to do today.